﻿ RSW Airport Transportation (Flat Rate Taxi) to Cape Coral, Pine Island, Useppa, North Captiva and Coastal Lee County | Pine Island Taxi and Limo Services, Inc. Designed with your travel comfort in mind, the new Executive Vans are the first and only vans available with convenient center-isle seating which distinctly sets us apart from the competition in the rapidly growing chauffeured, pre-arranged transportation services. With our luxury van service, we are able to accommodate up to 10 or 11 passengers with luggage and 13 passengers without luggage. The spacious rear compartment is designed to accommodate 10 average suitcases easily. Clients vacationing on the Outer Islands with parties of 8 or more we recommend an optional trailer as an alternative. If you have an excess amount of luggage and/or have a large grocery order a trailer maximizes convenience with your travel. Want to go together as a group? Have more luggage than will fit in a car? Our Executive vans are the way to get you there. Let some one else do the driving. Call for quotes! 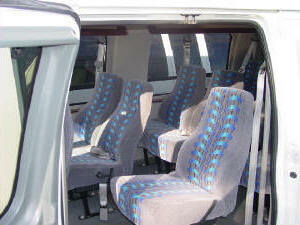 Most popular vehicle for airport service, business meetings, dinners and events. This impressive car leaves you saying Wow! Offering a spacious extra 6 inches of rear seat leg room. Enjoy luxury black car service, you are worth it!